This memorial at Alness Point on the Cromarty Firth, marks the site of the former World War Two Coastal Command Flying Boat Base and is dedicated to the memory of all who served here. Some of whom bought freedom from tyranny at the expense of their lives. There is nothing left of RAF Alness (Alness Flying Boat Base) now except a slipway where seaplanes were drawn up on to land. 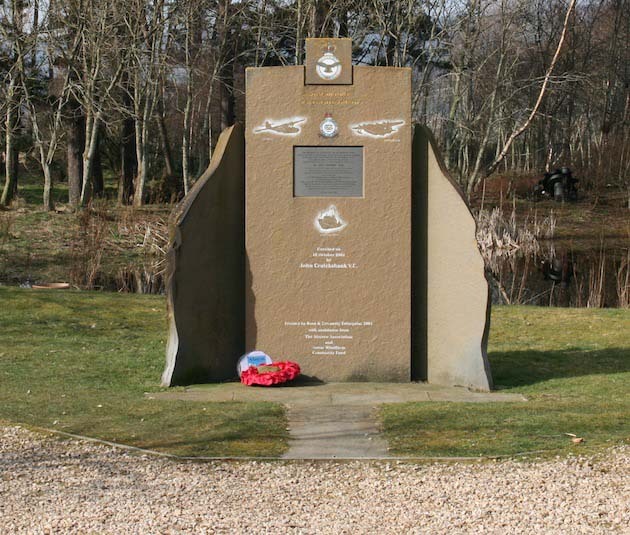 The area has been developed as Alness Business Park and this Memorial is at the entrance to it..
Best known as RAF Alness, the base had a long history of development as a service for the Naval Base at Invergordon. Although most famous for Catalinas and Sunderlands (photo-galleries below), it also had Singapores, Lerwick, Stranraer, and London seaplanes operating at one time or other. There is a lot of information on these on the Internet, so this part mainly features the Catalina. The Catalina was a flying boat designed in 1935 and about 3,000 were manufactured in San Diego by Consolidated Aircraft in the US and in Canada. It is a tribute to its excellent design that 40-50 are still in service. As the photo (in the Gallery) shows it is/was a high-wing, twin-engined aircraft with a range of about 4,000Km (2,500 miles). This made it very suitable for reconnaisance work such as submarine-hunting. Its prime disadvantage was slow speed; ie about 200 mph which gave submarines time to dive. The Catalina was fitted with radar early on. One technique I remember was that the Catalina had two powerful spotlights which were positioned so that at a certain height they formed a single spot. This was used in bomb-aiming. Another odd feature of the Catalina was that it had a'retarding rack' type of bomb release which enabled the bomb to drop in a straight line, instead of a curve. The WW2 record seems to show that of Germany's 1141 submarines, 761 were 'lost' or destroyed. It is worth noting that U-boat losses in 1942 were 86, but in 1943 this rose (rapidly) to 239, and to 234 in 1944. Was that 'rapid increase' due to Alan Turing's contribution at Bletchley Park? The Catalina accounted for only 36 of these, but realise that for every one 'kill' there were two 'disabled', or put out of action, if only temporarily. So the Catalina took out about a 100, or 10% which is quite good for a single weapon. U-boats is a record of that 36. There is also a list of the crews of Merchant ships sunk where the lists can be searched by 'last name'. It is part of an excellent and extensive database of records relating to the U-boat. It goes to show what a successful strategy it was on the part of the Germans. That same database includes a list of the crews of merchant ships sunk, so is a Memorial in itself. In summary the U-boat sank over 850,000 tons of shipping, causing loss of life of 75,762 in the Merchant Navy and Royal Navy. See the 'Photo Gallery' for two videos on the Catalina. Also a 'Last Sunderland Flying' video in 'Sunderland' on Nav Bar below. Interesting afterthought: When moored, it was usual for flying boats to be turned into the wind in stormy weather. This was not done on one occasion which caused some to sink, unfortunately causing loss of life among crews. These seaplanes may still be there - now there's a thing! !